BeldarBlog: Why is this young man's hair mussed? Why is this young man's hair mussed? This is my younger son, Adam, age 15, in a photo snapped earlier today. Adam's a freshman at Bellaire High School here in Houston. On Saturdays, it's not uncommon for his hair to be mussed. But the reason his hair is mussed in this particular way on this particular day is pretty cool, in my admittedly biased opinion. The first picture in this series showed a particular species of "hat-hair" that may be called "wrestler's headgear hair." 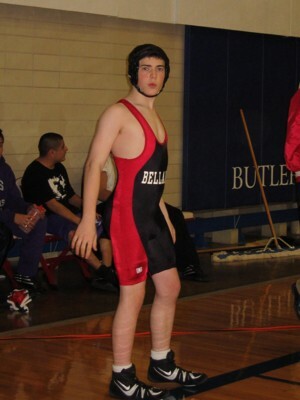 But below is a full-length photo of Adam taken in his headgear and his Cardinals-red and black singlet, just before his last bout today at the Butler Fieldhouse, site of the 2008 wrestling competition for District 23, which includes Bellaire High School. Also present for the day to root for Adam and his teammates, pictured below during one of the many moments of downtime inherent in such competitions, were my older son, Kevin (now a sophomore at the University of Houston), and my younger daughter, Molly (someday to be part of the BHS Class of 2013, but for now a 7th grader at Johnston Middle School, where she plays soccer). My ex (not pictured) finished with her Saturday patients in time to join us in watching Adam's final match, so Adam's entire family was there for him today. 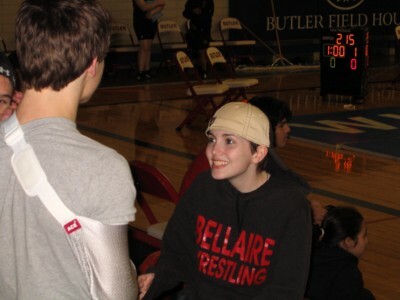 In the earlier photo of Sarah, the broad-shouldered young man shown from behind is Jonathan Eagleson, a sophomore who lettered as a freshman last year, and who is definitely one of the Bellaire team's most talented wrestlers this year. Tragically, near the end of a very successful day at a preparatory meet a week ago, Jonathan injured his collarbone, and while we're hoping for a full recovery in time for next season, he couldn't compete for the Cardinals today. But Jonathan (who's also pictured below with Sarah and Adam today) is a natural leader among his teammates; so of course he and his dad Bary were there with the rest of the team at 6:45 a.m. for the weigh-ins, and the two of them, along with Jonathan's mom Guinn, were among the last folks out of the building at day's end. (Bary and his brothers were all wrestlers in their day, too, so he knows lots more about the sport than I or most parents do.) The Eaglesons have been treasured family friends for many years — Jonathan's older brother Christopher, now a sophomore at Rice University, graduated with Kevin from Bellaire in 2006, but they'd been classmates and close friends quite literally since their kindergarten days. 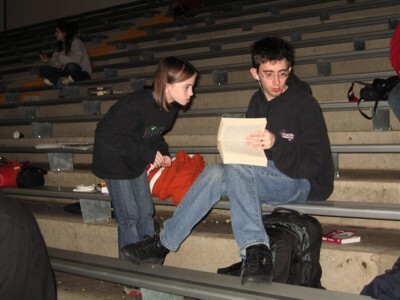 Jonathan and Sarah are also great buddies. He's been a terrific role model and mentor for Adam in wrestling this year, and we're enormously proud of him, too! The Eagleson family joined ours in a happy dinner tonight to celebrate Adam's best day so far as a wrestler, one that will win him a varsity letter jacket: Although several other competitors on Bellaire's very young and hungry team placed as high as fourth today at district, Adam was the only member of the team who'll be going on to the Region III competition. 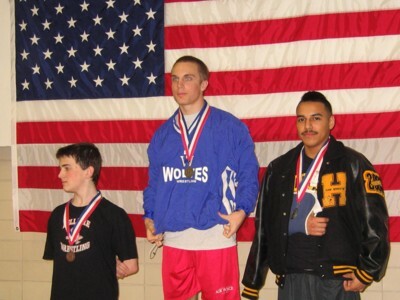 The photo below shows the three top finishers in the men's 140-pound category: District Champion Joey Ducker of wrestling powerhouse and overall meet winner Westside High School (center); second-place finisher Luis Guzman of Sam Houston High School (right), who'd defeated Adam in an earlier match but injured his collarbone in the finals against Ducker; and third-place finisher Adam Dyer of Bellaire High School (left), who'll go to next weekend's regional contest as District 23's first alternate in the 140-pound category. We certainly wish young Mr. Guzman (who is a classy and talented athlete) a quick and full recovery, but if he's not able to compete, Adam will do his best in trying to represent our district along with young Mr. Ducker. Congratulations. You've got lots of demands on your time, but you've figured out that one of the best things you can do (when you get time out of the office) is watch your children's high school athletic games. I used to leave the office whenever I could to watch my two daughters high school basketball and volleyball games. They were lightly attended and frequently I was the only father there. My daughters' teammates surreptitiously observed me very closely to see what my reaction was to the action on the court. The girls on the team cared desperately that at least one father was there to watch. I saw a lot of mediocre to lousy basketball and volleyball play--and wouldn't have missed it for the world. Mr. Myers, I would not have traded today for 50-yard-line tickets at tomorrow's Super Bowl. What a great family! 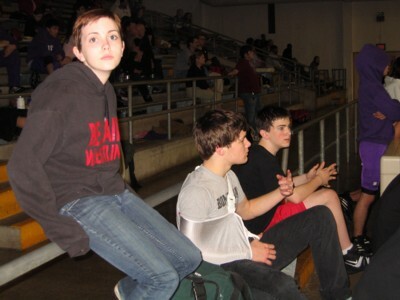 I come from a family of wrestlers (all 3 brothers participated at a variety of weight classes). While I was on the field hockey and swimming teams, a friend, with a lot of guts, was the first female wrestler on our HS team (this was the late 1970s). Your account brings back so many memories. Good times, good times. Best wishes to your family. Can you picture parent Beldar in the stands excoriating the referee? "Hey REF ! ! Vestri matris gero certamen tabernus ! ! !" Awesome, awesome, awesome :-). Thanks for sharing this! Wrestling is a great sport. My younger brother wrestled in HS and at UVA (ACC champ at 130) and his oldest son is a HS wrestling coach in Vermont. 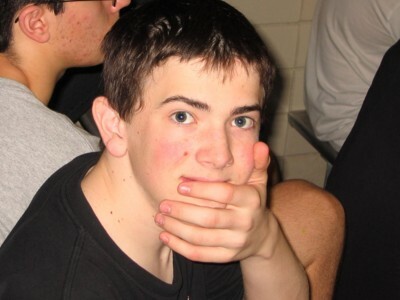 One of my sons in law was also a fine HS wrestler. Wrestling is still the biggest sport at my college, Lehigh University, but, alas, I was only a swimmer there. But whenever I can, I watch AAU, olympic and college wrestling on TV. Like you, I would rather watch it than the Super Bowl. A little more seriously, it is fine to read this post, which lowers the blood pressure, refreshes the spirit, and gives us all to wonder if the human species might have something going for it after all. Many thanks. I don't know anything about wrestling but I know about kids and families. Yours sound terrific.